J Rae & Cie (La Dorade) | What are the favourite cakes? 10 Apr What are the favourite cakes? From well-kept secret family recipes to flavours from around the world, the world of pastry has its classics and its great favourites. 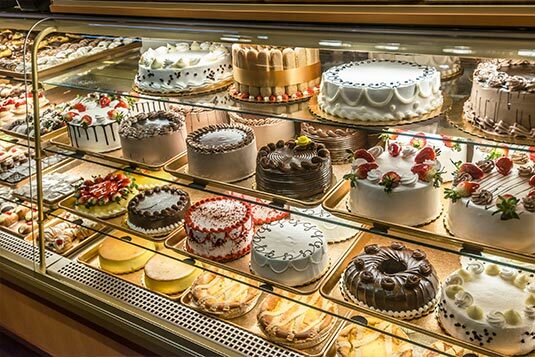 What are the cakes and desserts you should imperatively have in your shop window? Creamy mousses and Tiramisu, culinary art is delicious! For smooth cheesecakes, simply mix 500 g of our Continental Cheesecake Mix with 500 ml of water at high speed. No cooking required, just put it in the fridge. Add an extra layer of happiness with a delicious topping; from strawberry to kiwi, we have something for every sweet tooth. Filled with fruit, cream or chocolate, pies have always been very popular. Create a beautiful selection with our toppings made of real pieces of fruit, available in different packaging. Choux and éclairs have been pleasing generations of foodies! To prepare them, simply mix 400 g of “Apito Choux Paste Mix”, 400 ml of water and 8 eggs, adding the eggs one by one. 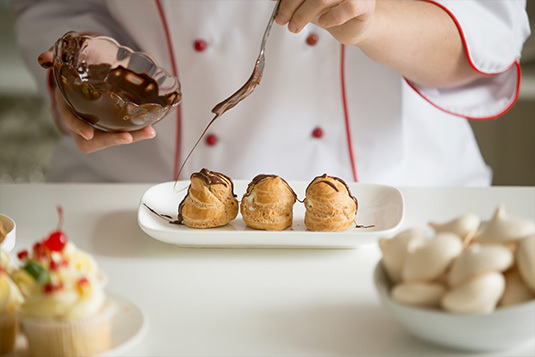 Shape your choux and éclairs and bake at ± 220ºC for 20 minutes. Leave the oven closed for the first 10 minutes and slightly open for the remaining 10 minutes. Our famous marbled vanilla chocolate cake is ready in no time with our sponge cake mixes. Delicious and economical, the Mauritian madeira cake is always a great choice. All-time favourites and popular all over the world, the brownie has seduced Mauritians! Moist inside and crunchy on the outside, this little chocolate delight will increase your sales! Cupcakes are real eye candy! No matter what the season, there’s a cupcake for every reason! From weddings to birthdays, they are part of all the celebrations. To create these irresistible goodies that look just as sweet as they taste, we offer our mixes for sponge cake, as well as a wide choice of decorations and toppings. Red Velvet or Black Forest? A classic of Anglo-Saxon confectionery, the Red Velvet Cake is a real treat to the senses. One of the most popular and favoured cakes in the world, the Black Forest offers layers of pleasure. Prepare them to perfection with our mixes and toppings. You have all the most scrumptious secrets to boost your sales. It’s time to preheat the oven!